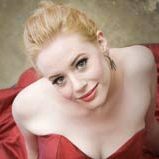 Berlin born Lotte Betts-Dean is an established Australian lyric mezzo-soprano who has appeared as soloist with the Royal Melbourne Philharmonic, Australian National Academy of Music and La Compania. She is a regular artist with Victorian Opera and enjoys an active concert schedule. Winner of the Armstead Award, the RMP Aria, and the Robert Salzer Vocal Championship, Lotte was selected to attend the 2013 Si Parla Si Canta course in Italy and the 2013 Neil Semer Vocal Institute in Germany.